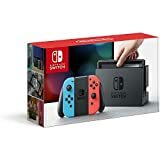 Nintendo Switch is the latest video game console from Nintendo and is actually a further development of Wii U and it is the first modular console – it can be used both stationary as a TV and mobile as a handheld. It is a step forward for the future of the gaming industry – the entire console is simply a 6.2-inch tablet. Small controllers, called Joy-Cons, can either be connected to the sides of the screen or pressed and two controllers that can be used in multiplayer games like 1-2-switch, or for two-handed motion-driven games like the upcoming video game Arms. You can also connect the Joy-Cons to the Controller Handle accessory that comes with the switch. Nintendo Switch is based on the Tegra processor from Nvidia. The new API, NVN, is specifically designed to create a fast, uncomplicated and compact gaming experience. We have selected some Amazon deals for you.